Recently I started using WinSCP more often for configuring a new VPS and I'm glad to see that it is nicely stable even at beta builds. 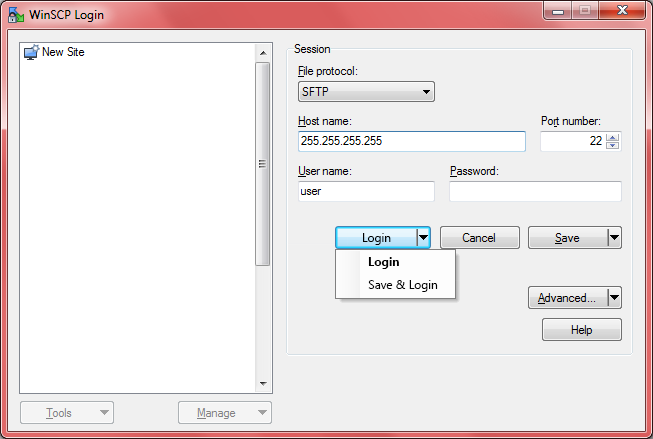 - When managing Shared Location Profiles, "Index out of bounds" error is triggered when trying to Remove folders, when, but only when, there is a shared location profile having "/root" as Remote Directory (OR having "/username" being it the username of the saved session, I'm not sure if it is related to the name of the saved session (usually "username@IP")). 1. Add a new Shared Location Profile with any Local Dir and /root as Remote Dir. 2. Add another profile with any dirs. 4. Close and reopen the Shared Location Profiles dialog. 5. Click the folder where you placed the new profile and try to delete it. 6. The error will trigger. 7. If you try to delete it again without closing the dialog before, WSCP will crash or display an "Invalid memory access" error. - "Allow SCP fallback" option is not memorized and always disabled. - Older versions allowed us to "edit" the settings of a saved session and login without saving it again, very useful to test changes before saving the options. - Missing options in Tools menu under Site Manager (aka New Session) when it is opened from toolbar. - It would be nice (if practicable) to have a way to move tab bar together with another toolbar, in order to spend less vertical space of screen if only a few tabs are opened (especially because widescreens have more horizontal than vertical space available). (It looks like what IE 9 did). - In the new Overwrite Confirmation dialog, I would like to be able to move from Yes to No (and vice-versa) using the right/left keys instead of only tab. Thanks for your great work, Martin! I'm aware of this regression. Will see how people miss this. That was always like this. It's by purpose as some of these options chance configuration globally, what would cause troubles then done while the application is running. What particular option would you find useful while application is running? Ok, I see. Will check that. Interesting idea (I'm not using Internet Explorer, so I've never noticed). One advantage of the old behavior is that it does not change (or even touch) the config file, avoiding any write error; another advantage is security, as if you do an accidental or undesirable change to an option and forget to change it back. We could also use the settings of one arbitrary site and change only the ip or connection type, for example, to log in once using different settings. The new way looks much less practical, may it be to reuse settings temporarily, test new settings, editing advanced options or other. Imo, it is now a noobfied dialog, from the perspective of usability. What advantage inspired you for changing its design? Not really needing this, but I just perceived the problem when was trying to find the Clean Up item (which don't have what I needed). By the way, something I was needing was an easy way to clear cached things that make the config file a growing monster (mostly the CDCache parts of the .ini, I think). Btw, the About and Check Updates are two things that must not cause any harm to be there. Other than that, I think much more trouble happens when two or more instances of WSCP are running, each one may change settings based on a different edition of the config file when it was loaded in memory, and then each one that is closed will replace the file with the settings it has in memory. Very often it causes the lost of settings, bookmarks, etc. made in one instance but not in the others. I also don't like how WSCP locks all the background screens when some kind of dialogs are opened (e.g. the 'Connecting to...', Login, Preferences etc.). In many programs they live together with the rest and don't need to block access to other parts of the program. This is specially good, for example, when we are working with folders/files and want to open a new connection, but want to continue working on the current tab while it connects in another tab. (Maybe this can be thought as the function "open link in a background tab" of browsers). This was always possible with the normal buttons which don't have a drop-down menu. Same thing happens in the Login dialog with the new buttons. Another thing I noted these days is this: toggling between tabs does not memorize the position of scrollbar and always go back to start, I mean, it goes back to where the last selected line is (after changing tabs, the scroll position makes that line the last in the list). I personally think it is more intuitive to remember the scrollbar position I set, not the line I eventually selected (especially when no line was selected by the user, ".." line is always selected). Previous design was all wrong. It mixed session editing dialog with sites (stored sessions) management. It was confusing how the Edit button switched the views within the same window. New users were not able to understand the flow. I understand that for you as a long time user, this was not a problem and you enjoyed the advantages of the previous design. But I believe that most (less frequent/new) users would find the new design more understandable. Definitely. But these are there on the initial Login dialog only to allow access to these functions without requiring you to connect. Otherwise they should not be there at all. Both true. But both are as well difficult to implement. I was thinking about adding Use as Template command (to drop down menu of Edit button) that would do the same what Edit button did in older versions of WinSCP (would switch to New Site entry in the new version with settings loaded). I know, but it requires you to login to each server first. My idea was to clean it for all saved sites, without needing to login to each one. Yes, that could be an option... But why don't you simply enable Login button? Or transform it into two: "Save and Login" and "Login" (or "Login without saving"). PS: Another thing I noted recently, is that the Open function does not work for all selected files (only the first one), instead, Edit does work. You can also disable the cache altogether. First, I want the dialog to focus on editing only, when you are editing. Also it would not be clear that Login button does (where would you put Login without saving?). That's true. What's your use case for this? Selecting some log files and press Enter to open then in the associated program. Usually the expected behavior is to open all selected files when pressing Enter as happens with Windows Explorer. I'm not sure about the need of such "editing mode" to exist, because imo it looks a bit redundant as right when you select a bookmark you're supposed to be able to edit it. Maybe you'll want "Save & Login" as default, resembling the OK button; but I think the Login (not saving) is more safe as default. Also, Save button is at right, resembling a typical Apply button. I do not think so. Editing is very rare operation. The primary purpose of the dialog is to login to a site, not edit it. I see you 'fixed' #1069 as a "Command to clone site settings to a new site", but can one login without saving it first? (Or it saves automatically during cloning process?) May I see it in action in a test build, or, are you close to release a new beta? Yes you can login without saving it first. I have sent you an email with dev version.